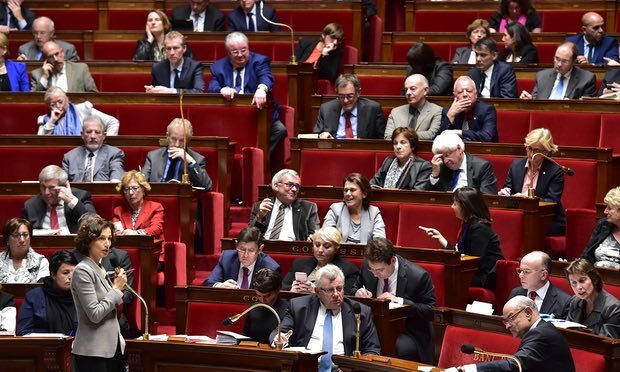 The French National Assembly has approved a plan to outlaw abortioninformation websites that masquerade as neutral, official services with freephone helpline numbers but promote anti-abortion propaganda and pressure women not to terminate pregnancies. The Socialist government’s proposal seeks to criminalise any websites that deliberately mislead, intimidate or “exert psychological or moral pressure” on a woman seeking information about terminating a pregnancy, with punishment of up to two years in prison and a €30,000 fine. It will now need to pass through the French senate. The issue has sparked a row in recent days, with a Catholic archbishop writing to François Hollande, the president, warning of a threat to freedom of expression. MPs debating the bill heckled each other and complained of vicious insults in committee hearings. France legalised abortion more than 40 years ago and already has a law that makes it a criminal offence to intimate or pressure a woman in order to stop her terminating a pregnancy. This law was initially aimed at anti-abortion protesters in the 1980s who tried to physically obstruct women from accessing clinics or advice centres, and was later extended to anyone exerting moral or psychological pressure on women. The government now wants to extend the law further to include websites, claiming that the anti-abortion battle that used to take place outside clinics has now moved online. A first attempt to pass the new law was blocked by the senate earlier this year. On Thursday the Socialist women’s minister, Laurence Rossignol, told parliament that the government was not seeking to clamp down on anti-abortion opinion in general, but on sites that she said deliberately hid their true nature and tried to manipulate women with an “insidious” pressure. She said anti-abortion groups “now act in a masked way, hidden behind platforms that appear neutral and objective and which copy and compete with official government information sites”, thus “deliberately seeking to trick women”. Rightwing opposition MPs firmly opposed the bill. Dominique Tian, a Republican MP, said there was a “very heavy atmosphere in parliament” and accused the government of “attacking freedom of expression”. He said the government’s proposals were “dangerous for democracy and probably anti-constitutional”, and his party would do all it could to block them. Last week Georges Pontier, the archbishop of Marseille and head of the French bishops’ conference, warned Hollande that the plans posed a threat to freedom of expression and “freedom of conscience”, and represented “a very serious attack on the principles of democracy”. Another bishop said the government was trying to act as “thought police”. The issue of abortion also arose during the right’s primary race to chose its presidential candidate. François Fillon, who on Sunday won the Republican party’s nomination and is now favourite to win the presidency next year, had said earlier this year that because of his personal Christian faith he could not “approve abortion”. During his nomination campaign, however, he stressed he would never make any changes to French abortion law. Yet another example of some other country doing better than America. Sad that we’re only #1 in military spending and incarceration rates….